Avree Jefferson, third grader at Immaculate Conception School in Macon is awarded this year’s trophy for Best Design in the 2019 Awesome Artist drawing contest brought to you by Chariton Valley. She is the daughter of Aaron and Loree Jefferson. The Awesome Artist Contest, now its thirteenth year, incorporates community children with the Chariton Valley Telephone Directory. Area third graders are invited to submit a drawing of their choice in the chance it will be selected to publish in the Chariton Valley Telephone Directory. This year 281 sketches were received from 18 area schools. A committee narrowed the entries to the top 5 and Chariton Valley Employees made the final selection. All participants’ names were entered for a $25 cash prize drawing. 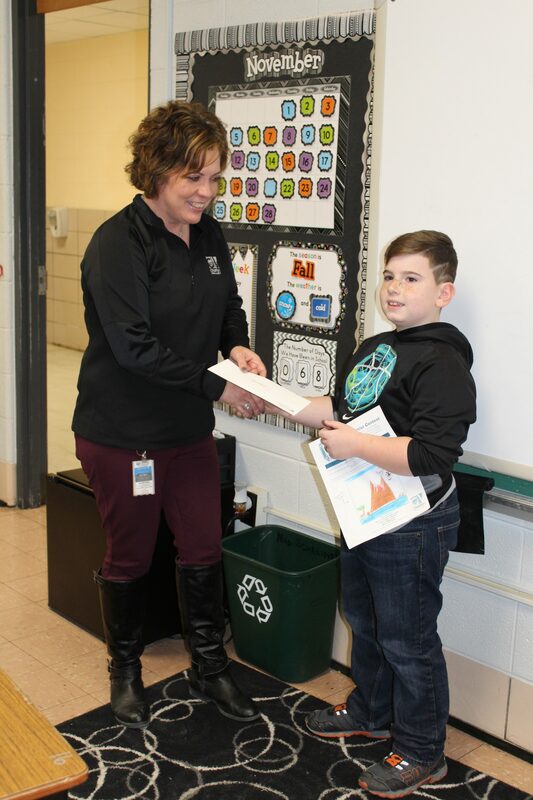 Jackson Cole son of James and Courtney Cole ­­of Salisbury Elementary won the cash prize. Check out the yellow pages of the 2019 Chariton Valley Telephone Directory when they arrive in February 2019 to view more drawings submitted by this year’s area 3rd graders. “As your local telecommunications provider, it is exciting for us to be a part of the communities we serve, even in small ways!” stated Donna Bell, Chariton Valley’s Public Relations/Economic Development Manager. 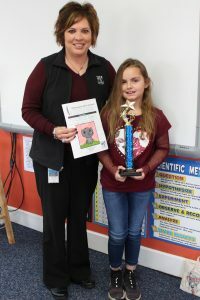 “We have some very talented 3rd graders and we appreciate all who participated in this contest,” she concluded. For more information about the Awesome Artist Contest sponsored by Chariton Valley call 660-395-9636. Becky Brockman, Chariton Valley Administrative Assistant, surprises Avree Jefferson 3rd grader at Mary Immaculate School and Jackson Cole 3rd grader at Salisbury Elementary during class to announce that they were winners of Chariton Valley’s 2019 Awesome Artist contest. A trophy and $25 cash was awarded to Avree for Best Design and Jackson’s name was drawn for the $25 participation cash prize!